Summary: Yoke is fell which forms part of the Ill Bell ridge that seperates the Kentmere and Troutbeck valleys and most walkers will visit Yoke as part of this ridge route. It is also one of the fells on the excellent Kentmere Horseshoe circuit. Wainwright gave the fell a height of 2309′ which he took from the 1 inch O.S. map of the time. However, the name Yoke is quite interesting, on the earlier 6 inch O.S. map the name was spelt Yolk and even before that the spelling was Yoak. The name has nothing to do with eggs but more likely to reflect the shape of the ridge line, the rounded undulations being similar to that of a wooden Yoke which was used to either tether oxen or to carry buckets. Early maps indicate Yoke as being the shoulder of land 500m south-west of the summit as we know it now (on which there is a collapsed cairn and fine views of Windermere). Over time the name has been taken to cover the whole of the fell and is now spelt as Yoke. Whilst most walkers just cross the fell from north to south on the well made new path there is much more to this hill. Only by viewing it from the east can the dramatic crags and coves of the fell be seen. 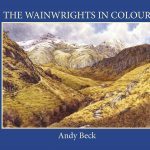 Wainwright listed Yoke on all of his lists and it has its own chapter in book two, The Far Eastern Fells but in his explorations even he (and his subsequent revisors) did not ascend the fell by the best route of all, that of the route above Rainsborrow Crag. This fine climb provides not only an excuse to explore the old ruined mine buildings in Rainsborrow Cove but also a steep way to the summit with excellent views and excitement. Even now the way is almost pathless and quiet. Both the east and west slopes of the fell are scarred by disused slate quarries. At the foot of the fell on the eastern side and near to the outlet of Kentmere reservoir there are a couple of old mine buildings which having been restored in 2007 and are used as accommodation for outdoors activities groups. The romans apparently had a fortlet on the summit of Yoke but it is hard to find evidence on the ground. 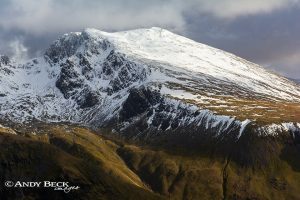 Topographical features: The height of the fell is now given as 2316′ 706m and the summit is at GR: NY43774 06739 where a rough cairn sits on a platform of rock, not far from the corner of a new post and wire fence. The cairn is the Wainwright summit. Points of interest: Disused slate quarries on the lower slopes of the fell on the east and west sides. Well worth a visit is the cavern of Cauldron quarry (explore with care). Also old mine buildings in Rainsborrow Cove are worth a look. Views from the summit are best to the west, for a better view of Windermere visit the shoulder of the ridge 500m south-west. As mentioned above, the ascent via Rainsbarrow Crag is a delight but not for the inexperienced. Adjoining fells: Ill Bell lies to the north, easily reached by a good path on a broad ridge. Nearest facilites: Car parking in Kentmere, limited spaces near the village hall (honesty box), other parking can be had in a farmers field as you approach the village, small fee for all day parking and not open every day (mostly weekends in summer). Car parking also available near Troutbeck Church, limited spaces (free). Food, drink and accommodation in Troutbeck at The Mortal Man or The Queen’s Head. Tearoom at The Old Post Office, Troutbeck. Tarns: Rainsborrow tarn, 2 nameless tarns just north of the summit. Waterfalls: several are marked on the maps on gills which run off the slopes of the fell but these have yet to be investigated. They are unlikely to be spectacular. Star rating: (3.4 / 5) Most walkers will question this high rating for a fell they just plod across. If time is taken to explore the fell fully and try out the routes described above then the rating will be understood.